The BLR-1 Blue Light Radiometer measures the intensity produced by the FL5000 Inspection Light in units of μW/cm2 (microwatts per square centimeter). Conventional UV meters will not respond to the blue wavelengths of the FL5000, so a new meter was needed. 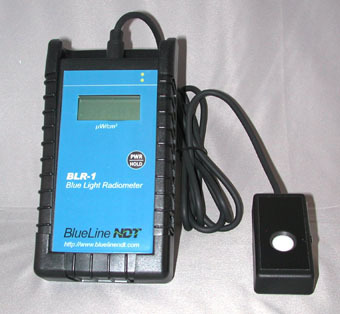 BlueLine has teamed with International Light Technologies, a long-established manufacturer of high quality light measurement instruments, to produce the BlueLine BLR-1 Blue Light Radiometer. At the touch of the power button the BLR-1 reads out directly in μW/cm2 with NIST traceable calibration.